The holidays have arrived and there’s plenty to do around your 2Hopkins apartment in Baltimore City. We’ve gathered up bar crawls, holiday markets and shopping extravaganzas to provide you a 2Hopkins-approved list featuring the best of Baltimore during the holidays. Perhaps the most well known Baltimore holiday event, the Christmas Village returns for it’s 5th year at the Inner Harbor, from November 23 to December 24. Modeled after a traditional German Christmas village, this indoor/outdoor market features vendors in over 50 booths, selling traditional European food and drink, international handmade gifts, ornaments, jewelry, arts and crafts. Put on your mittens and coat, and enjoy a brisk walk from 2Hopkins apartments in Baltimore City to the Inner Harbor. Grab a mug of warm, mulled wine and a Belgian waffle, then get some shopping done! This Baltimore holiday celebration is quickly becoming a new classic. 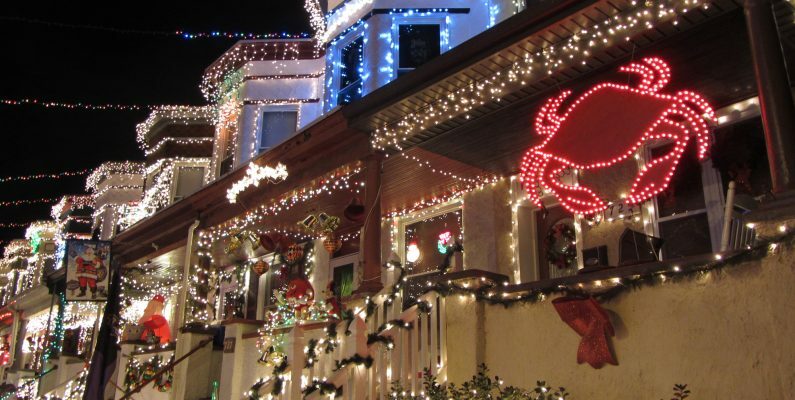 The classic Baltimore event, Miracle on 34th Street, opened on November 25th and will run nightly throughout the holiday season. A quick drive from 2Hopkins apartments, this event (now in it’s 71st year!) is jam-packed with bright and shiny holiday fun. Das Bier Haus is hosting their Second Annual SOBO SantaCon on December 9. This year, they’ve teamed up with Federal Hill favorites Don’t Know Tavern and Delia Foley’s for even more festive fun. Dress up as Santa or Mrs. Claus and receive drink specials all day and night long! The super cool Remington food hall, R.House, is teaming up with Baltimore Vintage to bring you an afternoon of flea market fun on December 17, from 11:00 a.m. to 4:00 p.m. Shop for last minute holiday gifts at one of the 50+ vintage vendors while enjoying seasonal beverages from R.House. What’s better than a sip-and-shop event nearby your apartment in Baltimore City? With so much going on this season, we encourage you to schedule some time for holiday cheer near your 2Hopkins apartment in Baltimore City.